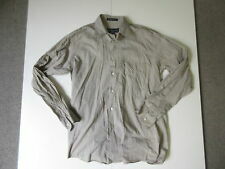 Burberry London LONG SLEEVE SHIRT- Size 4XB 20". 100% Cotton. Shoulder to bottom: 82 cm. Average condition - Item has obvious signs of wear or use and may require repair etc. Armpit to armpit: 50 cm. Very good condition - Item is starting to show signs of wear or use that are not overly noticeable. Sleeve Length Long Sleeve. Fit Regular. Size Type Regular. Material 100% Cotton. Style Button-Front. We have offices in the United States, Hong Kong and New Zealand. 100% Authentic. Color : red & military olive green. Pattern Plaid. Material 100% Cotton. Sleeve Length Long Sleeve. Style Button-Front. Pattern Plaid. Material 100% Cotton. Style Button-Front. Sleeves (from center of back collar to edge of sleeve): 34". Length (bottom of collar down back to hem): 31". Sleeve Length Long Sleeve. Pattern Plaids & Checks. Material 100% Cotton. Color Multi-Color. BURBERRY BRIT. BRIGHT VIOLET SMALL SHIRT. : chest 17.5 ". : shoulder 18". Then the troubles can be avoided for both of us. Size Type Regular. But Canada, Hawaii, and Puerto Rico are no included. By Burberry Brit; imported. Check-print lining peeks out at the cuff and collar of a lightweight poplin sport shirt with a bit of stretch for comfort. Single-button cuffs. Back yoke. 97% cotton, 3% elastane. Sleeve Length Long Sleeve. We have offices in the United States, Hong Kong and New Zealand. Fit Regular. Size Type Regular. Style Button-Front. Material Cotton. Material 100% Cotton. Color : white. Color White. Lot # 12-0. 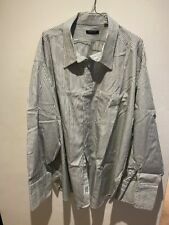 New Burberry Brit Long Sleeved Shirt. We have offices in the United States, Hong Kong and New Zealand. Color Gray. Pattern Plaids & Checks. Size Type Regular. Sleeve Length Long Sleeve. Style Button-Front. Sleeve Length Long Sleeve. Country/Region of Manufacture Thailand. We have offices in the United States, Hong Kong and New Zealand. Fit Regular. Size Type Regular. Material 100% Cotton. Style Button-Front. Sleeve Length Long Sleeve. We have offices in the United States, Hong Kong and New Zealand. Size Type Regular. Style Button-Front. Material 100% Cotton. 100% Authentic. Color Mid Blue. We have offices in the United States, Hong Kong and New Zealand. Fit Regular. Material Cotton. Size Type Regular. Style Button-Front. Sleeve Length Long Sleeve. 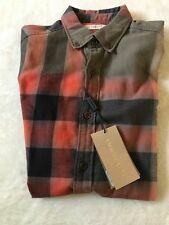 New Burberry Brit Casual Shirt. Sleeve Length Long Sleeve. Size Type Regular. Material 100% Cotton. Style Button-Front. We have offices in the United States, Hong Kong and New Zealand. We have offices in the United States, Hong Kong and New Zealand. Sleeve Length Long Sleeve. Material 100% Cotton. Size Type Regular. Style Button-Front. 100% Authentic. Material 100% Cotton. Color Blue. Sleeve Length Long Sleeve. Sleeve Length Long Sleeve. We have offices in the United States, Hong Kong and New Zealand. Size Type Regular. Style Button-Front. Material 100% Cotton. Color Crimson. Style Polo, Rugby. Sleeve Length Long Sleeve. Size Type Regular. Material 100% Cotton. We have offices in the United States, Hong Kong and New Zealand. Sleeve Length Long Sleeve. Fit Regular. Material 100% Cotton. Size Type Regular. Style Button-Front. We have offices in the United States, Hong Kong and New Zealand. Pattern Plaids & Checks. Sleeve Length Long Sleeve. 100% Authentic. Material 100% Cotton. We have offices in the United States, Hong Kong and New Zealand. Location Reminder Color Multi-Color. Style Button-Front. Sleeve Length Long Sleeve. Fit Regular. Size Type Regular. Material Cotton. Style Button-Front. Color Black. We have offices in the United States, Hong Kong and New Zealand.